Weigh-in time: 7:30 a.m. to 8:15 a.m.
Meeting and Program time: 8:30 a.m. to 9:30 a.m.
We are so happy to welcome you to our website with information about TOPS (Take Off Pounds Sensibly) and our own little chapter in the small town of Kathleen, Florida. Our town may be small, but we are filled with LOTS OF SUPPORT AND ENCOURAGEMENT for those who are looking to Taking Off Pounds Sensibly! I am an intelligent person, I will control my emotions and not let my emotions control me, Every time I am tempted to use food to satisfy my frustrated desires, build up my injured ego or dull my senses; I will remember -- even though I overeat in private, my excess poundage is there for all the world to see --- I WILL TAKE OFF POUNDS SENSIBLY! We have found that we are not the only one who faces emotional eating, gets frustrated, or whose self-esteem has taken a beating. No matter how we become a part of TOPS, we all realize we have found a place we can go each week where everyone truly understands the problem of being overweight. They care how you feel. They support you while you try to figure out what triggers your overeating. They walk beside you on your journey to becoming a KOPS (Keep Off Pounds Sensibly). Take each others hand; walk beside your pals. Listen and write notes of encouragement. You are, after all, an intelligent person! My name is Sarah Hernandez and I became familiar with the name TOPS many years ago when my mother, Susan Feathers, now passed, belonged to a chapter at the Eagles her hometown of St. Mary's, Ohio, however this chapter is now disbanded. In December of 2002, I decided I was tired of wearing elastic shorts that expanded with my weight as did the size 2X and 3X T-shirts I wore. Remembering my mother was a member of TOPS at one time, but unfamiliar with TOPS, I decided to find a chapter in my area to attend. I looked on the TOPS website where I was given the contact information of Donna Bragdon, the area captain, who was very helpful in locating my chapter TOPS #FL660, Lakeland. On January 8th, 2003, deciding to start the New Year right, my daughter, SuZee Hick and I walked into this strange new place and was greeted as if we had been long lost friends. I was shocked when I stepped on the scale--238 & 1/2 pounds! I knew I was heavy, however I never realized how obese I really was. The first thing I did when arriving home from my first meeting was to throw out the bathroom scale. I knew if it was in the house I would be checking my progress each day, which we know can be disappointing. In the following weeks at chapter meetings I learned many things and continue to learn something new each week. The first thing I learned was new ways of NOT dieting, but eating sensibly. Next I learned to drink water---YUCK! That was the most difficult for me and I still struggle, however I do drink atleast three 20 ounce bottles of water each day, which I must admit is much better for me than the 12 pack of coke I use to drink each day. I learned to write down everything I would eat, even a bite. Each week I could go back into my journal and know my reasons for gaining or losing. There were no surprises! I learned to read labels, understand serving sizes and adjust my meals. I have taught my young daughter, Jasmin and my 3 grandchildren to read labels. My grandson, Alex, age 6, is always quick to let me know how many fats and calories are in a product. I learned exercise is important. I learned there is an abundance of great tasting recipes, foods, beverages and desserts. I learned that eating sensibly doesn’t mean you dontt get to enjoy great tasting meals. I learned I could call a member, like Leader, Bee Jay Marchand when I was feeling down, happy, or just needed a friend. 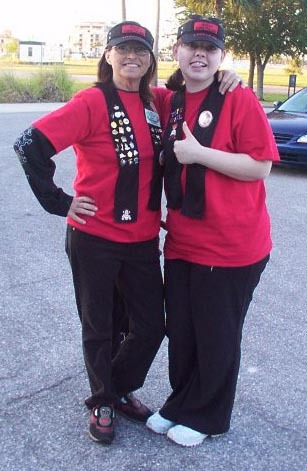 I learned going to TOPS with a family member, like my daughter, SuZee and my daughter, Krystyna, who joined our chapter in October of 2003, is like bringing along your own personal cheering section! I reached my goal on December 10th, 2003 with a 100 & 1/2 pound loss. I love to see the smile on my husband, Sebastian’s face when people we haven’t seen for a while takes him to the side to ask him what happened to his wife and who is that new lady on his arm! It is true that I drank the water each day. I watched my fats and calories. I kept a journal. I exercised, but it was my fellow members “my friends”, who gave me, the encouragement and strength to succeed. Their kind words, their hugs, their cards and their smiles are what gave me the strength to continue the journey to my goal. They had faith in me when sometimes I did not have faith in myself Words cannot describe what is engraved deep in my heart for each and every one of my fellow members. Each person with their own personality, those with a different way of eating or exercising, those with a different way of showing support, but each member has taught me something to help me achieve my goal. So members of TOPS #FL660, Lakeland, and all other TOPS members who have helped me reach my goal, give yourself a pat on the back, hold another members hand and feel proud in your heart to know that Hand in Hand, you are the reason for my succeeding. I thank you for being there then.. ..and now!